Both the Sonoma Film Festival and the Food & Farm Film Fest play through Sunday. And the Tiburon Intl. Film Festival officially opens Thursday. B+ The Red Shoes, Castro, Thursday. This 1948 Technicolor fable about sacrificing oneself for art makes a slight story. Luckily, the characters, all fanatically devoted to their art, and all very British, make up for it—at least in the first half. Unfortunately, the final hour weighs down with more melodrama than even a well-acted film can bear. On the other hand—and this is why The Red Shoes holds on to its classic status—the 20-minute ballet at the center is a masterpiece of filmed dance, and no other picture used three-strip Technicolor this expressively. I discuss The Red Shoes in more detail at War and Ballet @ the PFA. A Amadeus, Pacific Film Archive, Saturday, 5:00. In this tale of two composers, the driven, determined, and successful Salieri (F. Murray Abraham) desires greatness and thinks he’s achieved it. Then he meets Mozart (Tom Hulce), who just seems to happily glide through life, with brilliant music pouring out of his head. Only Salieri can see that Mozart is the better composer, and that drives him into some very dark places. A story of talent, jealousy, and the creative spark, accompanied by some of the best music ever written. This director’s cut is significantly longer than the version that won the 1984 Best Picture Oscar; I like both of them. Introduction by Paul Zaentz. Part of the series More Than Fantasy: In Memoriam, Saul Zaentz (1921–2014). A+ The Lady Eve, Stanford, Friday through Sunday. 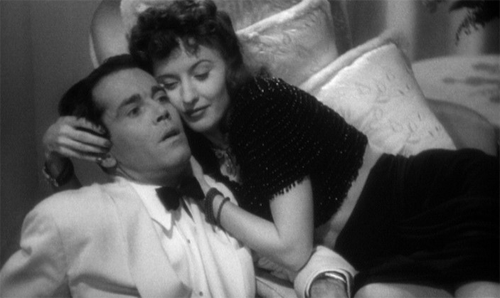 Like all great screwballs (and it my opinion, this is the best), The Lady Eve looks at class differences as well as the differences between a free-spirited woman and an uptight man (Barbara Stanwyck and Henry Fonda). Stanwyck plays the younger half of a father/daughter team of card sharks, who makes the mistake of falling in love with her current mark–a wonderfully naïve Fonda. The result: crazy hijinks in glamorous settings. On a double bill with Lady of Burlesque, which I have not seen. B+ Don’t Stop Believin’, Lark, Friday, 8:00. I’m not a Journey fan, but this music documentary made me a fan of the band’s new lead singer, Arnel Pineda. He’s charismatic, energetic, down-to-earth, and funny. He also has a great set of pipes. Ramona S. Diaz’s documentary tells the story of how he became a part of Journey. Band members, desperate for a new singer, found the poverty-stricken, Manilla-based Pineda on Youtube, flew him out to California, worked with him for a few weeks, then took him on the most successful tour in Journey’s long history. This is a true-life fairy tale lacks conflict–the worst thing that happens to Arnel is a head cold–but Pineda has such a magnetic personality you don’t really care. The Miles Schon Band will play after the movie. 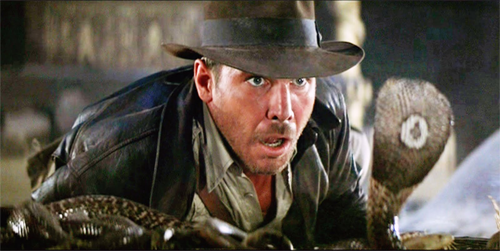 A+ Raiders of the Lost Ark, UA Berkeley, Thursday, 9:00. Steven Spielberg directed it, and the bad guys are Nazis, but it’s as far from Schindler’s List as a great movie can get. But then, it’s great in an entirely different way. There’s absolutely nothing to take seriously in Raiders of the Lost Ark, and no message to help uplift you. The story is fundamentally preposterous, and the hero (Harrison Ford) is no more an archeologist than I am a butterfly. But the energy is so high, the action scenes so brilliantly choreographed and edited, and the whole story told with such enthusiasm and wit, that the rest of it just doesn’t matter. If you object to mindless, escapist action flicks on principle, don’t see it; otherwise, you probably already love it. C+ Blue Jasmine, Castro, Wednesday. Cate Blanchett can do anything. In Woody Allen’s latest, she gives a great performance in an otherwise shallow and unbelievable drama. Once an obscenely rich socialite, the unhinged Jasmine (Blanchett) is now broke and moves in with her working-class but level-headed sister (Sally Hawkins). Spoiled and narcissistic, she makes everyone else miserable. Much of the film looks and sounds unrealistic (the working-case men all seem to come from New Jersey, despite the San Francisco setting), and Allen’s script gives us no reason to care about Jasmine. Read my longer essay. On a double bill with A Woman Under the Influence, a film that blew me away when I saw it nearly 40 years ago.